Aspinal's Soho Backpack draws a line between the classic and contemporary; pairing modern functionality with our tireless attention to detail, courtesy of our signature shield clasp and handcrafted finishes. 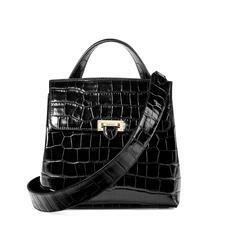 The croc print Italian calf leather, coupled with the vintage-inspired silhouette, communicates elevated elegance. 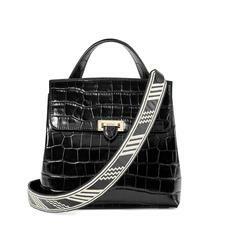 Underscoring this is the practicality of the versatile straps which allow the bag to be worn in a multitude of ways. Emanate a soft directive with hues of lilac and taupe or opt for the understated luxury of black, and discover the statement appeal of our embroidered straps.